The special focus of women’s use of technology has been a part of ICT projects for decades. Whether it’s focus groups, particular reports, or special training programs, the fact is that women are often a central point within ICT4D projects. But looking even further, what has all that work achieved for women’s empowerment? The San Francisco Technology community recently gathered together to discuss, “Technology for Women’s Empowerment: Failures, Solutions and Strategies,” and several insightful and interesting highlights came from the discussion. Those of us in ICT are all guilty of this. Besides being of the same gender, we forget that “women” are a completely diverse and vast term in and of itself that covers rural and urban, literate and illiterate, rich and poor, and more. By paying special attention to these differences, ICT practitioners (and especially data collectors) can adequately understand women’s use of technology in a better way. For example, it was mentioned that women may actually have access to a mobile phone as much as men, but they may not report it as often as men do. Or in other contexts, there may be a phone in the house, but it is controlled by the men, and therefore unavailable for the female members of the household, yet an enumerator may count her as having access. These small details may easily be overlooked, and to overcome that, one solution could be to ask data questions in a better way. This is so much easier said than done. Bringing women to the forefront of technology is much more than just hiring more women. Young girls need to be inspired to go into technology, and they need to see themselves in leadership roles. If men are still the majority on technology panels and are most of the world’s coders and engineers, then young women aren’t able to easily see themselves in those positions. 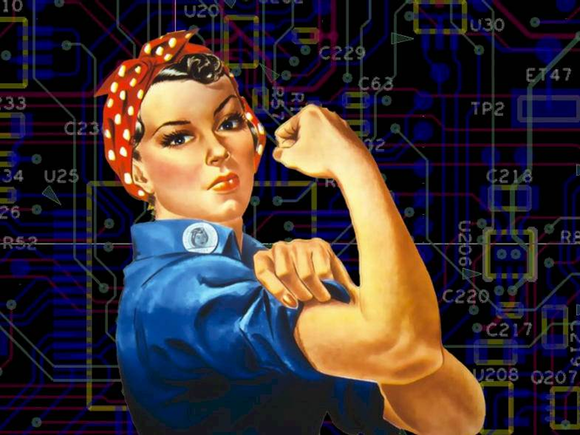 There is certainly progress with how many women work in technology both in the United States and around the world, but so much work still needs to be done. This seems obvious, but a Tech Salon participant helped point out how simple and practical this can be. By modeling positive female characters on a TV show, young girls are able to be inspired to make good decisions to further their education. Low tech methods must not be underwritten within the world of technology. It is vital to remember that not every solution needs to be something new – often helpful tools geared towards girls and women is already at a community’s fingertips. I believe that we’re on the right track, but the ICT4D world still has so far to go to fully engage women. It was both encouraging and humbling to see what has been done already, what techniques work, and what is still lagging behind. The talent and determination of both women and men will continue to help women gain the positions, titles, and access to technology they have so long deserved – and we’re all getting closer to that goal every day! By Jana Melpolder, a social media and marketing consultant in San Francisco.